On this particular sunny Sunday, I was supposed to be attending the wedding of my dear friend Meghan in Los Angeles. Two people I could not be happier for are celebrating their marriage outdoors in Elysian Park with a huge party. Instead of spending the day with them and dancing it up with friends and a speckle of celebrity attendees, I am here in New England because things don’t always work according to plan or intention. However, today is also Molly’s birthday and she will be having a get together later on this evening. So I have that to look forward to. 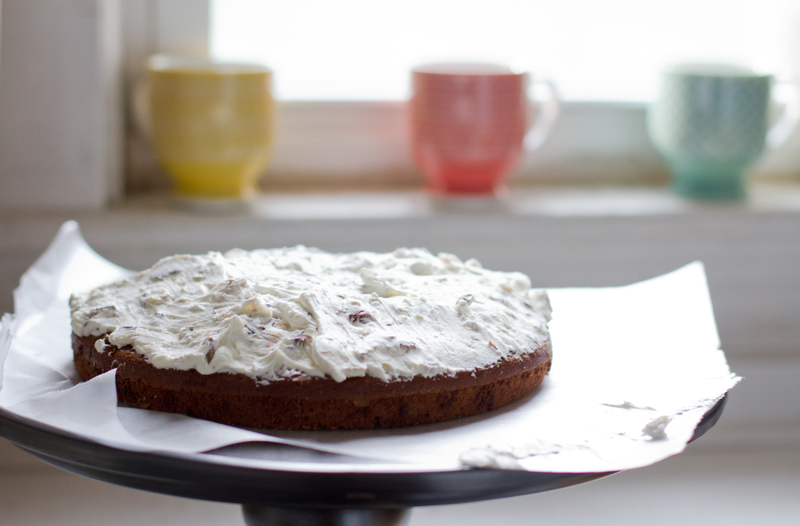 And, since I had the time, I made a cake to bring with me. I have only made this cake once before for another friend on her birthday years ago. I remember everyone enjoyed it thoroughly, and I felt it was time to get on it again. It’s not that hard to make and won’t take too long (as long as you aren’t staging photos, finding the right lighting and fighting with the dog because all she wants is to eat everything you are touching.) Oh, and the frosting is made with cheese. Enough said. Once you have all of your ingredients together, it’s time to get started. Now, for the cake, just get yourself a good quality chocolate cake mix. Unless you want to upstage me and make it from scratch. That’s totally cool. While the cake is baking, make the crunchy hazelnut caramel toffee. It’s pretty freaking simple. Water and sugar. Boil. Pour. Let set. Now that the cake is cooling and the toffee is chopped, it’s time to make the frosting. The key to making this correctly is to have the Marscapone cheese at room temperature for mixing. Another thing is to make the whipped cream portion of the frosting first before adding it to the rest of the ingredients. Once it’s all mixed, spread and even layer on top of the bottom layer of cake and sprinkle that with some of the orange zest/chocolate/sugar mixture. Next, add the top layer of cake. And more frosting. Once the chocolate cake is covered with the hazelnut crunch frosting, sprinkle as much of the orange/chocolate/sugar topping as you’d like. 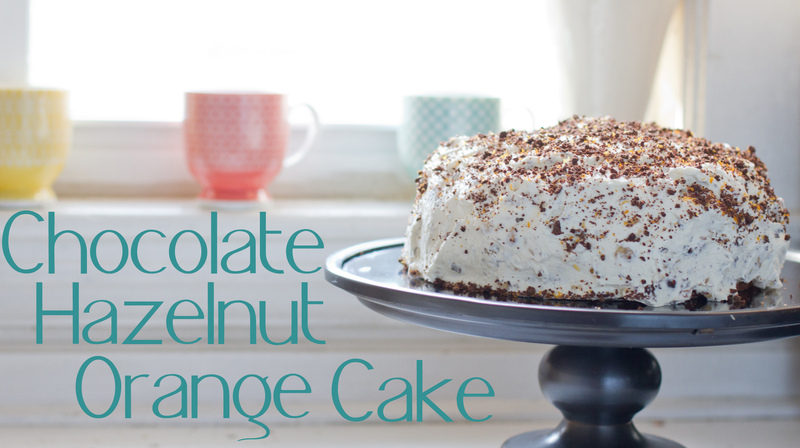 And all of a sudden, you have a cake everyone will LOVE. One box of chocolate cake mix. Divide the cake mixinto two round cake pans.Follow baking instructions on box. Remove from the oven and let cool on a wire rack. 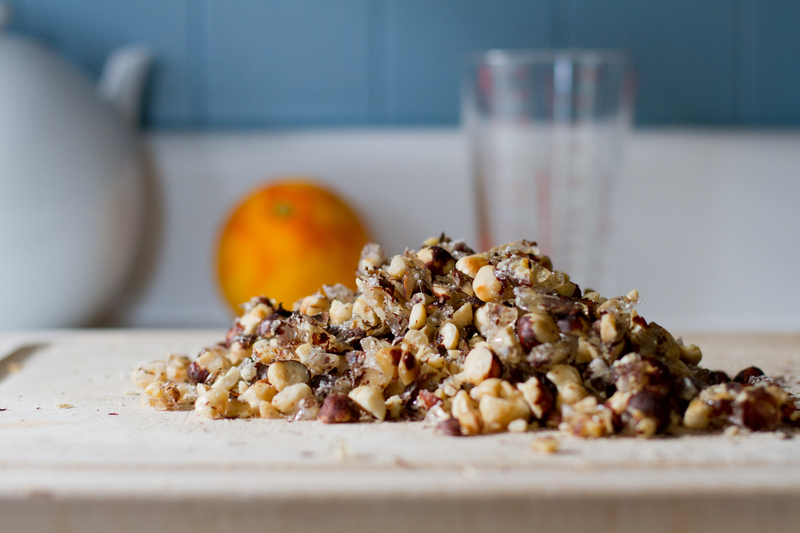 Place the toasted hazelnuts together in a single layer on a parchment-lined baking sheet. Combine the sugar and water in a small pot over medium-high heat. Stir the sugar into the water until dissolved. Bring mixture to a boil and let cook until the sugar is light brown, about 8 minutes. Let the bubbles subside and then pour the hot mixture over the nuts. Place the baking sheet in the refrigerator and let harden, about 30 minutes. Remove from fridge and top with another piece of parchment paper and pound into small pieces. You could also place the sugar nut mixture on a cutting board and cut into small pieces. Set aside. Put the marscapone cheese, powdered sugar, and vanilla into a large mixing bowl. 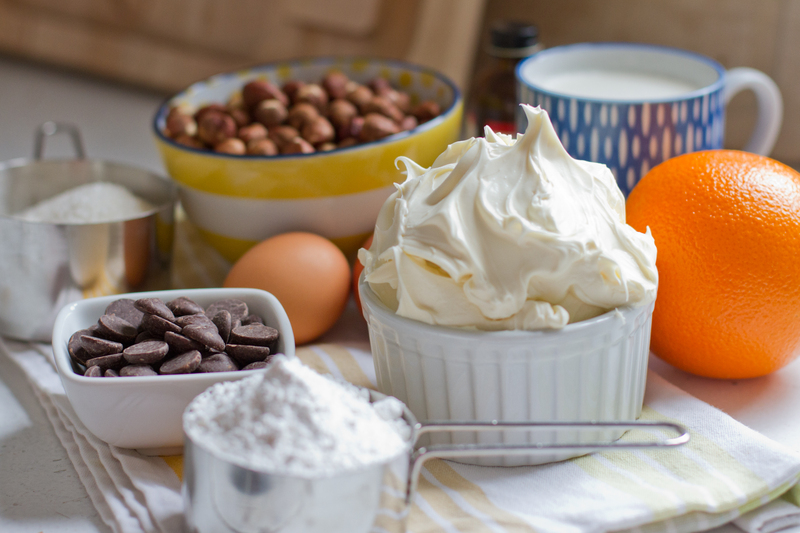 In a separate bowl with an electric mixer, whip the cream until it forms soft peaks. 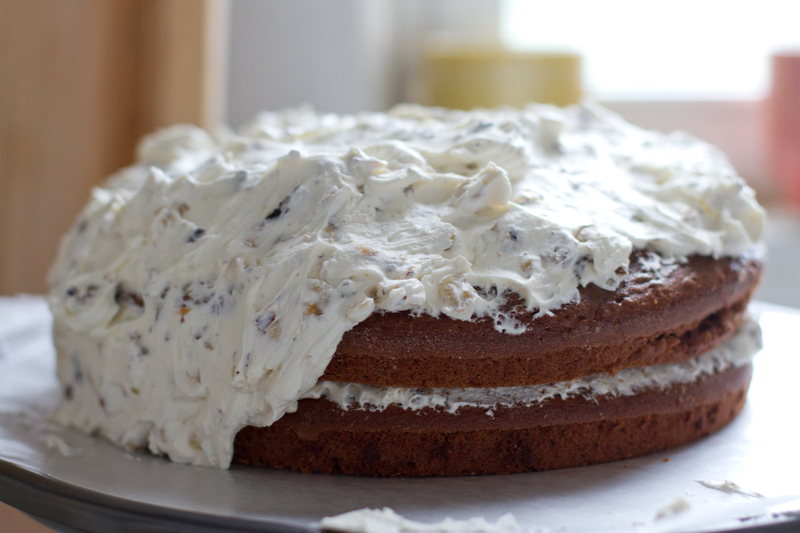 Fold the whipped cream into the marscapone mixture while also adding in the hazelnut crunch pieces as well. Place the chocolate, sugar and orange zest into a food processor. Process until finely ground together. Put 1 cake on a serving plate. Top with about an inch of the frosting mixture. 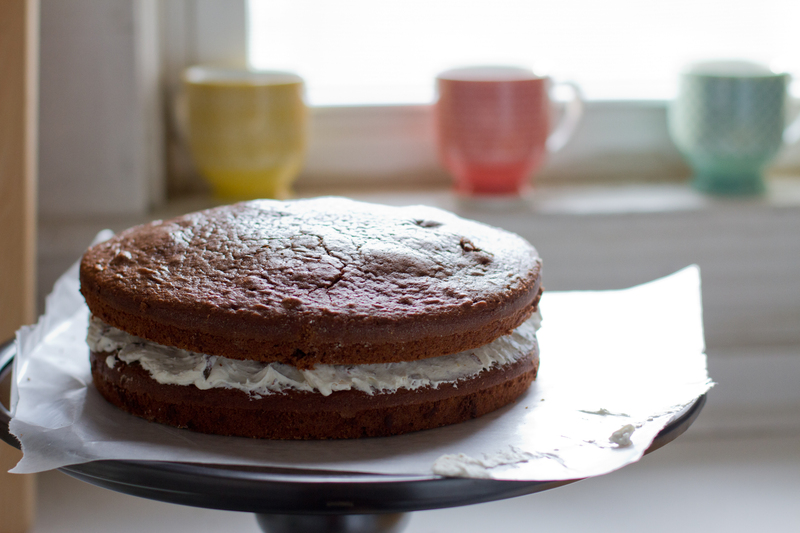 Top with the second layer of cake and continue to frost the entire cake. Once the cake is covered, sprinkle the top and sides of the cake with the ground chocolate. The above recipe has been adapted from Giada De Laurentiis’ Hazelnut Crunch Cake recipe. Oh dear lord sweet baby jesus thank god I’m not in Boston right now because that looks beyond delicious! 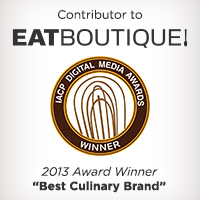 If you lived here (or I there), we’d eat way too much food together. Such a lovely cake! Hazelnut is one of my favorite flavors too. 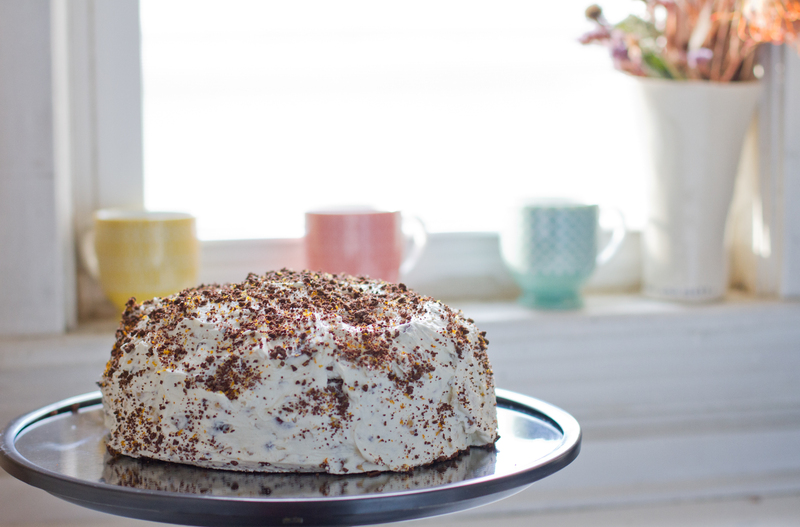 Some of my favorite ingredients combined into one cake – looks amazing! Hello! This is my first comment here so I just wanted to give a quick shout out and tell you I really enjoy reading through your posts. Can you recommend any other blogs/websites/forums that go over the same topics? Thank you!